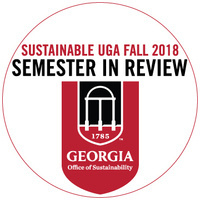 The Fall 2018 Sustainable UGA Semester in Review celebrates people, programs, activities and academic courses that are creating a culture of sustainability at UGA. The program includes brief presentations from the Office of Sustainability interns, posters and table displays from UGA classes, the announcement of 2018 Campus Sustainability Grant winners, light lunch fare and opportunities for networking. Opening comments will be provided by Libby Morris, Interim Senior Vice President for Academic Affairs and Provost. There will be a ceremony celebrating the Spring Sustainability Certificate graduates immediately following Semester in Review from 1:15-2:15 p.m., also in the Memorial Hall Ballroom.